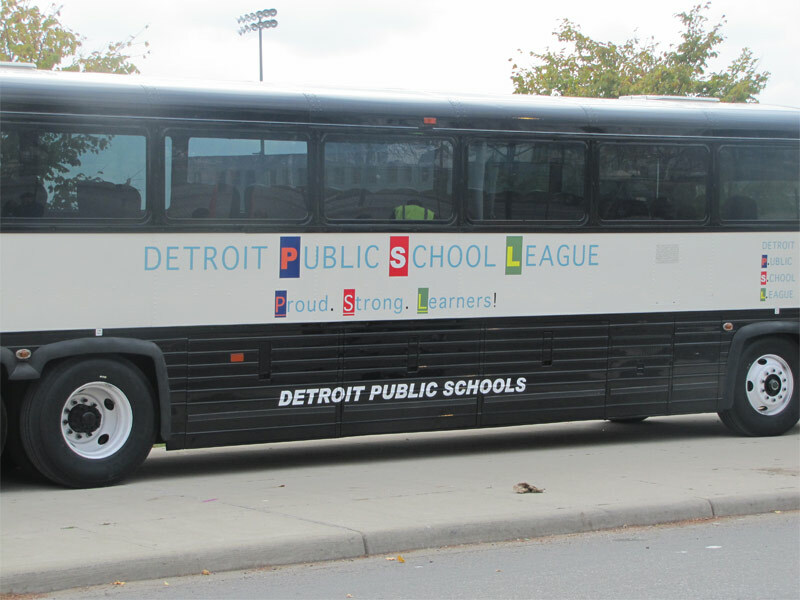 Detroit Public Schools on Thursday unveiled two newly-donated 47-seat luxury coaches donated by First Student for use by the school district’s athletic teams as part of a major rollout touting enhancements this year to the Detroit Public School League. DPS Emergency Financial Manager Robert C. Bobb and DPS Athletic Administrator Alvin Ward celebrated the buses’ arrival, along with the cheerleaders and football teams from Cass Tech and Central High, Cass Tech’s marching band and principals of both schools, before addressing sweeping changes to enhance the stature of the PSL, which has a storied athletic legacy. Strengthening academic standards for athletic eligibility. Beginning in the fall semester of 2011, all PSL scholar-athletes must have and maintain a minimum 2.0 grade point average in the core courses of math, English, science and social studies to be eligible to compete. This academic preparation is invaluable when the time comes for our scholar-athletes to enter college. Increasing athletic participation and fan support by raising the profile of the PSL. 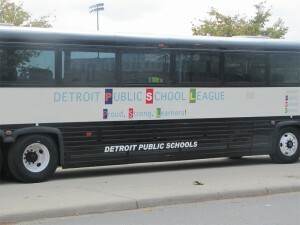 The football season’s Game of the Week, a Holiday basketball tournament, a new Sports Information Director, the Detroit Public School League page on Facebook, and a regular new feature honoring the league’s top boy and girl athletic performers — the Proud Strong Learners of the Week – are all geared toward generating positive exposure for the PSL. Increased oversight of PSL gate receipts. Through an audit conducted by the Office of Auditor General last year, the district found that cash management procedures at athletic events were inconsistent and not in compliance with policies outlined in the School Financial Management Manual and the DPS Interscholastic Athletic Manuals. Since then, the district has instituted improvements to the process of tracking and safeguarding the funds, including working with the Finance Department to establish cash management processes that allow greater monitoring of school athletic events. Premium on good coaches. All PSL coaching positions were filled after a required interviewing process that sought to hire coaches with the most-qualified leadership abilities for our young scholar-athletics. Rebranding the PSL through a fresh new logo that is included in the buses’ design. The PSL’s new slogan — Proud Strong Learners — emphasizes the district’s thrust toward a higher academic standard for athletic eligibility. The luxury buses donated by First Student will help elevate the PSL’s public profile. The buses are equipped with air conditioning, an on-board restroom, plush reclining seats with headrests, footrests and tinted windows. The coaches cost $450,000 each new; the value is $150,000 refurbished. Cass Tech and Central are the PSL’s recently-crowned A Division and B Division football city champions, respectively, and represent the caliber of teams that will likely be using the coaches for travel to competition away from the area. Ward also acknowledged donations of $20,000 from Comcast-Channel 900, which will televise several PSL basketball games this winter in an ongoing sponsorship; and $20,000 from Compuware Corporation. These donations come on the heels of a $10,000 contribution from General Motors Chief Executive Officer Dan Akerson. This entry was posted in Info News Center, News and Press Releases, Sports and tagged 510, Emergency Manager.